By launching Gordon Ramsay DASH, Glu gets closer to creating a Hell’s Kitchen-like game. 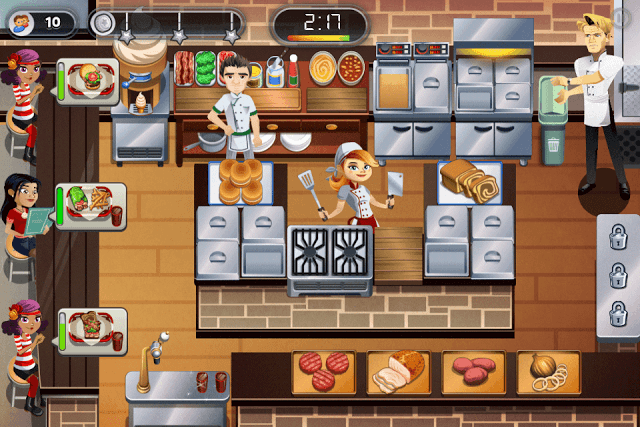 Gameplay is almost identical to Cooking Dash 2016, but the action takes place in Chef Ramsay’s kitchen, where he will guide you to prepare the most delicious dishes and serve customers faster.There are several new features sprinkled here and there. If two customers order a food item and a cola, you can serve them colas first if it’s taking time to prepare food for them. This will not only increase their impatient meter (in case their meter is turning yellow or red), but also earn you a few frenzy points. What you should you do is pick a cola and serve it to customer 1 and pick another cola to serve customer 2. This will trigger “Action Queue Bonus”. Alternatively, you can pick up two colas and serve both customers quickly to earn Frenzy points. Throwing unwanted, burned items or items that you have mistakenly picked up into the dustbin will roll the meter back to zero, so make sure you don’t mess up with the orders or burn food, else your hard-earned points will go down the drain. Do note that ingredients or food thrown into the dustbin can also trigger a time penalty. Actions that earn you Frenzy points may also earn you extra coins. Swiping coins to collect them is one the easiest way to earn Frenzy points. When two or more customers eat, pay and leave, you just swipe downward to collect them and earn points. However, things become difficult when one has paid and the other two are still eating, and this happens many times. In such situations you should tap to collect coins, because that seat won’t be occupied unless you have collected those coins. You can make customers drink and eat faster if you want to earn quick frenzy points by swiping coins. To do this, go to the “Upgrades” section and tap the “Décor” tab. Select Counter and upgrade it. If both customers have ordered the same dish, then you can easily serve them to get “Multi Serve Bonus”. Doing this, you will get more points and earn some bonus coins as well. Because the server uses both hands, he can easily pickup ingredients for two dishes of the same kind and serve them at once. Make Sure you upgrade Grill, Grill Storage, Fryer and Fryer Storage, Chopped Storage to increase slots and storage capacity respectively so that your chef can cook faster and food does not get burnt. This way you will be to serve customers faster, get that occasional multi-pickup and multi-serve bonus and earn points. Once you have unlocked Frenzy, you can begin playing Season 1 missions to earn frenzy points as well as bonus coins for actions like multi-serve, multi-pickups, action queue etc. This trick was also mentioned in the Cooking Dash 2016 guide. When customers order both cola and a dish, and you can’t attend them for some reason, what you can do is quickly serve them colas. This will immediately raise the patience meter above your customers’ head in case they have turned yellow or red. The meter shows how patient and happy your customer is and if it becomes empty, the customer will be angry and leave your restaurant. Try to make quick dishes that take less preparation time and serve them to those customers who have ordered them. I prefer playing Gordon Ramsay Dash with the sound turned off. Chef Gordon keeps pestering to serve customers faster and may even scold you for not being quick. If you get nervous easily and don’t want the voice chiding you constantly for your fumbles and mistakes, just go to “Settings” on the map screen and turn off Sound. This might help you focus on preparing dishes and serve customers faster. But if you want that Master Chef-like experience, then turn on Sound and enjoy playing this game as it is. Upgrading Grill will unlock an extra grill. Keep upgrading this appliance to make things cook faster and burn slower. Upgrade Grill Storage to increase its capacity. Grilled ingredients will be immediately transferred to this storage and won’t burn. More slots unlocked would eventually mean faster cooking. Upgrade Fryer to unlock another slot. Keep upgrading to increase burn time. Increased burn time won’t make food burn quickly. Don’t forget to upgrade Fryer Storage as well. This will increase its capacity and the fried items will be quickly transferred to the storage. Upgrading the chopping block will make your partner chop potatoes and other ingredients faster. Also upgrade the chopped storage to open up more slots so that the veggies will be stored in them when the chef finishes chopping them. Upgrade Cola Dispenser to get more than one cola. At level 2, it will earn extra coins for you. Upgrading the Condiments, BLT, Chili and Cheese Topping Station will increase the speed of adding toppings to your food items. Upgrade the Ice cream dispenser to make ice creams faster. In most levels, your goal will be to earn an X number of coins and get at least one star to advance to the next level. While performing certain actions like multi-serves etc. will get you some bonus coins, upgrading food is a sure-shot way to get more coins from customers. Upgrading food boosts their quality. Better the quality of a foodstuff, more coins you will earn from each customer. This will also result in reaching high stars. Tap the tiny Shop icon in the Seasons screen. This icon is located at the bottom left corner of the screen. Now tap the second tab, below appliances. This is where you can upgrade food to improve their quality. 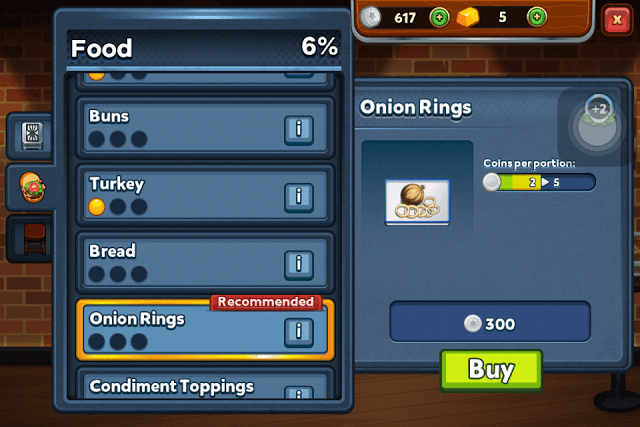 To earn more coins try to upgrade Beef, Turkey, Onion Rings and Potato. Save coins to upgrade them first. But don’t ignore toppings as well. In Gordon Ramsay DASH, your culinary skills are of no use if the customer is impatient or eats slow. Thankfully, you can change your customer’s behavior by upgrading décor. Tap the décor tab, which is located below the food tab in the upgrades section. Make sure you upgrade “Counter” first to get an eating speed boost. This will make customers eat, pay and leave faster. Upgrading the Art Sculpture will add an extra customer, whereas Carpet and Wall Art will increase customer patience when upgraded. You can play old season levels to earn extra coins. Don’t forget to perform actions to get “Multi Serve” and “Action Queue” bonuses. The “Trophies” section provides a list of tasks that you can complete to get rewards. These could be anything from coins to gold bars, even supplies! Tap the Trophies icon at the top-left corner of the home screen to get a list of tasks. At some point of time, you will be given an opportunity to prepare special recipes, delicious dishes for VIP customers. But for preparing them you will need food items that are not available in plenty. This is where the Farm Market may help you. It gets unlocked at player Level 9 and it will let you purchase the finest ingredients from other human players. You can also sell any food items via the market. You also get toppings and other stuff from time to time after completing a Venue’s Season. A Season contains several episodes. The “Bonus Offer” Usually appears when you lose an episode of a level. This offer may grant rewards like coins or supplies but for that you will have to watch a short advert to get them. Complete Season 3 to Unlock Expert Mode. As the name suggests, it’s a challenger of sorts, and completing it won’t be easy at all. In Expert Mode, two more stars are unlocked and if you reach them, you will earn extra rewards. Hi, I have a Samsung note 3. It’s old but it works. Hi, Try clearing cache/game data and play again. I play on Android and all too often I get 5 stars and then it crashes and I don’t get the stars. I do not have an over abundance of apps and none of them are running when I play. Any helpful ideas? Hi, Could you please tell me what Android device are you using? Brand/Model No.? I can’t duel. It tells me every time to check my network settings.I know I’m connected. Any ideas? Are you playing the Amazon version on Kindle Fire? If yes, then there are no new updates for the Amazon version AFAIK. Other Kindle Fire users are also having this problem. Try installing the same game from the Google Play Store and check whether the problem still persists. Any idea how I can get 5 stars in bay burgers season 4 episode 8? I serve all customers and use 3 boosts at a time I get only 4 stars and not five stars. To increase your chances of getting 5 stars in an episode, you should upgrade food, appliances and décor. Pizza Paisan – season 5 level 10. I have played it a million times, I serve all the customers and get full stars, but cannot achieve gold. Any tips? It could be a bug. There’s an old thread on Glu forums where players are complaining about the same. They too have played a level several times, got five stars, but still did not receive gold on that particular level. Try this: Don’t use Frenzy for the last set of customers (You can use frenzy for others). Serve them manually. See if you can get gold after gaining 5 stars. How to sell in farm market? Same for me in Dragon Bowl. I’m at 100% in all upgrades and have the auto chef and happy hour, but I can’t seem to get the last star in season 6, episodes 9 and 10. Any idea how I can serve all customers in delish and chips, I’ve got almost max upgrades including happy hour and there are a ton of episodes where I’ve got 5 stars but for love nor money I can’t serve everyone! !